Happy Friday and Happy Birthday to my sweet daughter! She turned 9 today and we had a great day celebrating. Sometimes I can't believe we made it to 9, she's quite the firecracker. 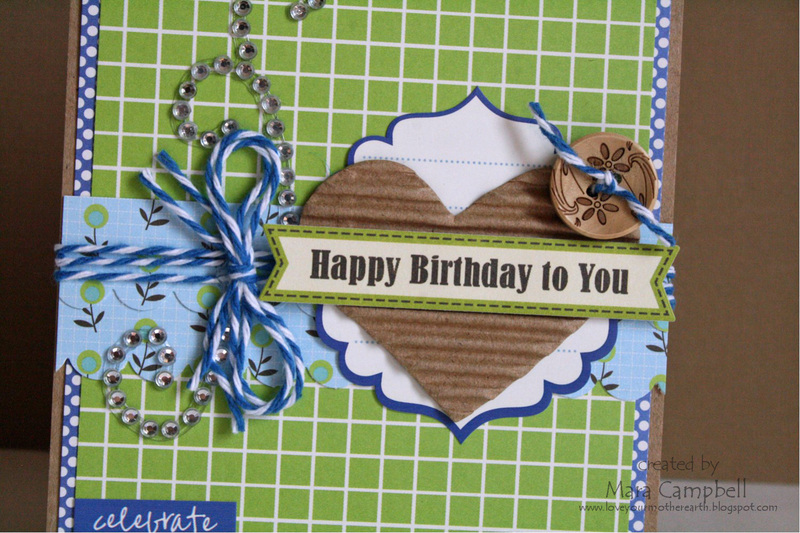 In honor of her birthday, I have a birthday card to share! I used lots of Jillibean Soup for this card. I love their decorated wood buttons! I am getting ready to head for bed after a long day. We have early morning soccer and the ONLY good thing about an 8am game is that it won't be 110 degrees outside yet. I will take early over heat right now for sure! I love the mint/chocolate combination almost as much as I love the peanut butter/chocolate combo. I could not resist picking up a bag of mint Oreos when I was at the store. I don't even know why I go near the cookie aisle, it turns out the same every time. So instead of just eating the oreos, I make cookies with them. Redundant, maybe...delicious, YES!! I've made triple chocolate oreo chunk cookies in the past and I used that recipe to start with. I used mint oreos instead of plain and I added just chocolate chips (no white chocolate chips in these cookies). The bonus ingredient was a cup of chopped Andes Mint pieces. Have you seen those at the store? They are already chopped up and ready to add to any cookie recipe! They were a fantastic addition to these already minty cookies. Here is the link to the original recipe from the Two Peas in the Pod blog: Triple Chocolate Oreo Chunk Cookies. I left out the white chips, added Andes Mint pieces and mint Oreos. I think these would be great with the Halloween Oreos out right now. How festive would those be on a fall cookie plate or in a neighbor's Boo Basket?!! Do you know what's great about scrappy friends? They buy the latest tools and then let you borrow them. 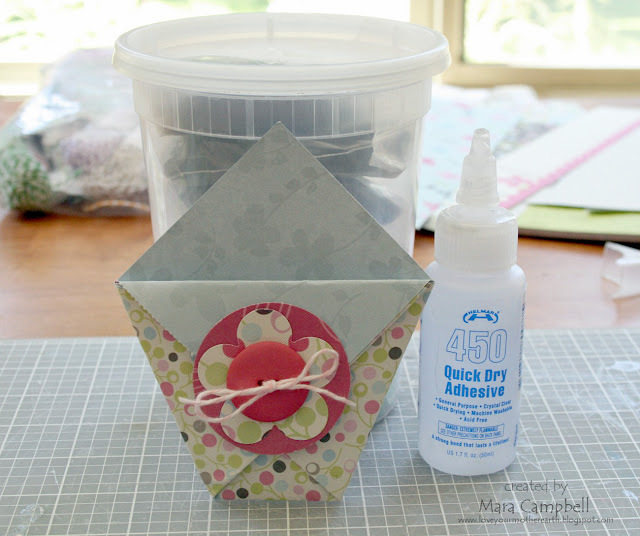 On the last scrap retreat I went to, I was able to borrow my girlfriend's 'around the corner' punch. It was really cool...once I got the hang of it! 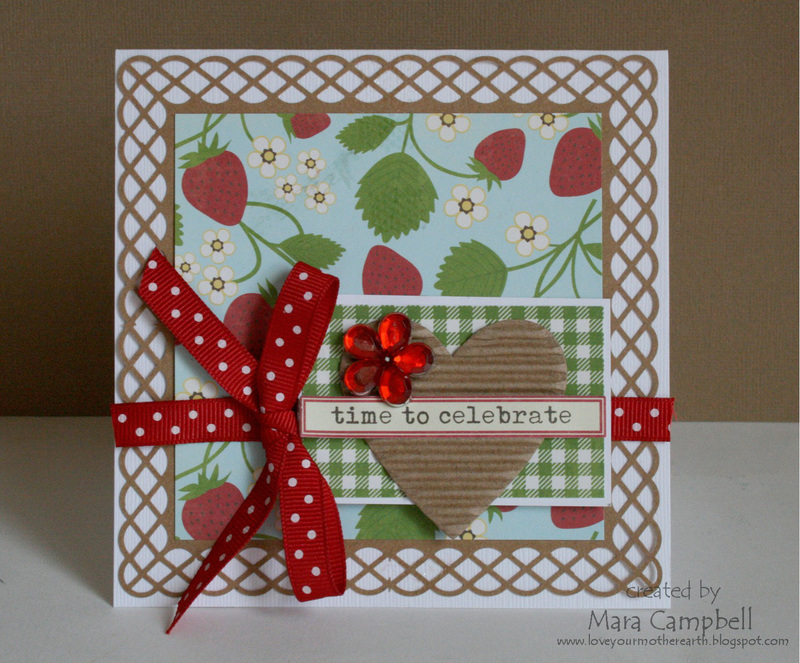 I made this strawberry birthday card using the border punch. I love that lattice border!! 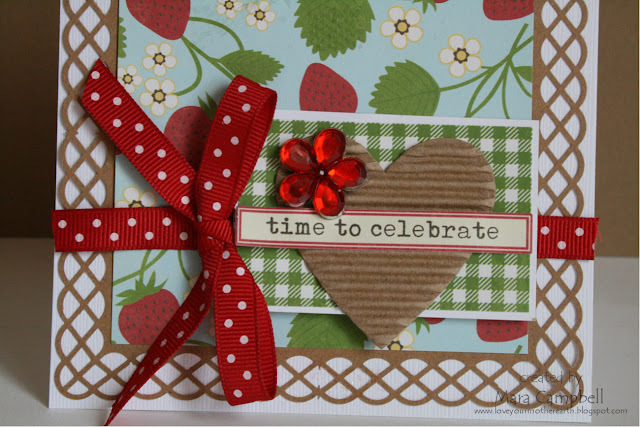 The paper is Jillibean Soup and I also added a Jillibean corrugated heart and sentiment sticker. The red bling I found on the table at the scrap retreat. 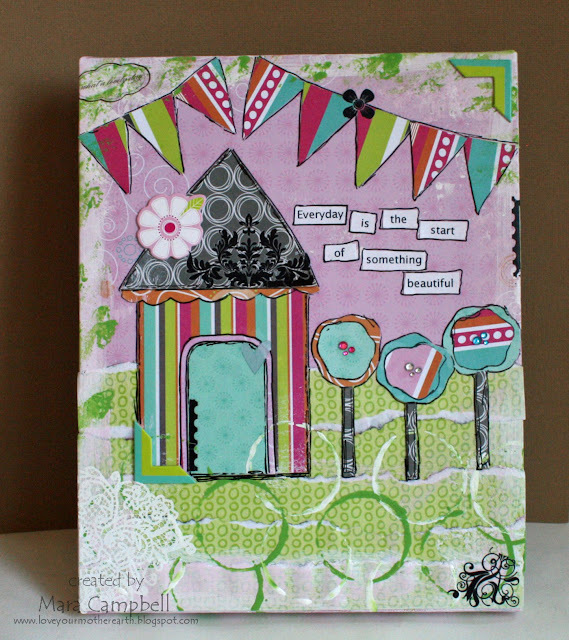 And it's pretty much 'I saw it FIRST' at the scrap retreat...so I used it. I also borrowed that great polka dotted ribbon from a friend...scrappy friends are the best. Thanks for stopping by today, scrappy friends! Happy Monday!! It was another hot, sticky, humid weekend here. The humidity is not normal for us and I don't like it one bit. We celebrated my daughter's birthday this weekend with family and friends and had a great time. Now it's back to the regularily scheduled program!! One other fun thing I did this weekend was check out a new art studio this past Friday night. A few months ago, some girlfriends and I bought groupons for a Girls Night Out at the art studio and finally had time to cash it in. We had such a great time. We were allowed to bring in snacks and wine, which was pretty cool. The woman who owns the place guided us through a painting. Here is my finished product! 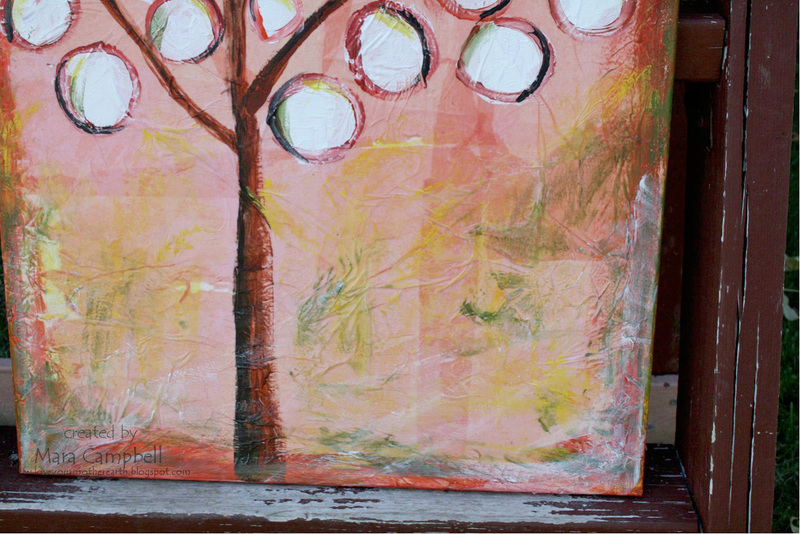 We started by adding tissue paper to our canvas using mod podge, which added some great texture. 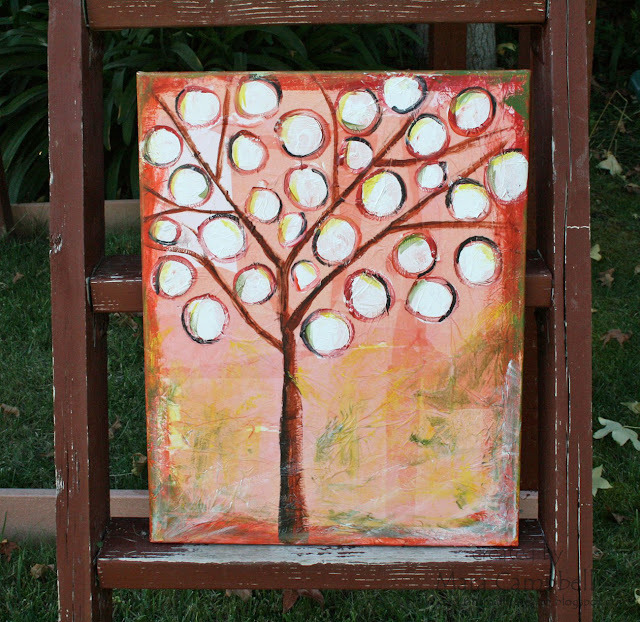 And then she guided us through mixing paint colors, drawing the base of the tree, added a border and more. It was so much fun, I loved the whole process. It was fun to draw out the texture of the tissue paper with some random swiping of paint. We painted all the circles and then added a border and some color inside. 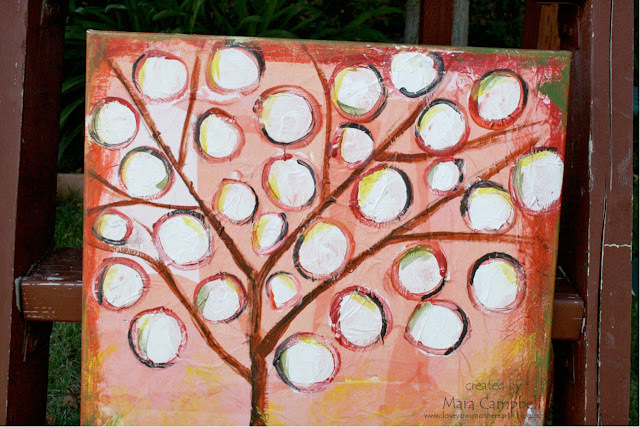 It was fun to see how some people filled their whole tree with circles (that would be me) and other people just had a few. She also showed us how to make leaves and a little black bird, but I didn't think I had room to spare. This class was SO much fun. We are already planning another night. The owner of the studio was awesome. She told us if we had enough people to reserve the night for just our group, we can choose the theme and she'll show us how to paint it (whatever 'it' may be). Isn't that cool? What a fun girls night out! I hope you all had a great weekend...enjoy your Monday, friends! Happy Happy Friday!! I hope you all had a great week. Momenta recently released covered canvases and I could not wait to get my hands on one. These canvases are covered with patterned paper from some of their collections and comes with a small sheet of chipboard embellishments and bling. 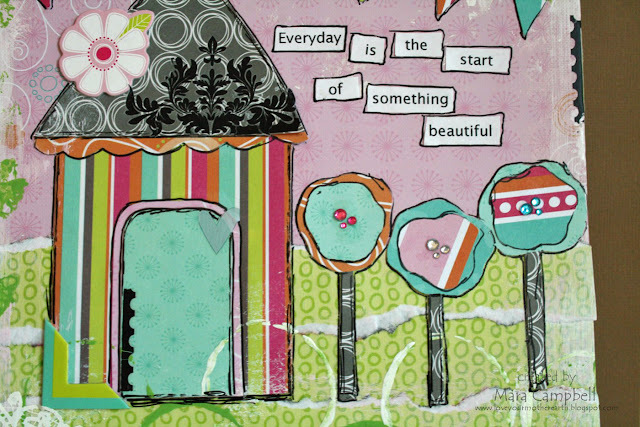 I had a great time altering this Kaleidoscope Creative Canvas. The subtle pink pattern is the original background and then I used the Kaleidoscope pyramid paper pack to create the rest of the details. I hand cut the house and the flowers and banner. 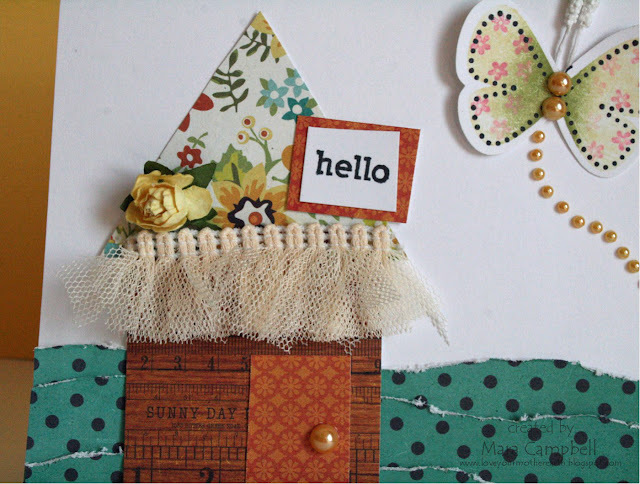 I used torn paper for the grass and used the flower chipboard embellie as a cute adornment to the roof. I finished it off with lots of paint smudges, toilet paper roll stamping and random rub-ons! This was so much fun to make! It was nice just getting messy with paint and not having to worry about straight lines or perfect stamping. I learned alot of these techniques from the She-Art workshop I took with Christy Tomlinson. If you are interested in anything mixed media, I highly recommend her workshops! They are so much fun and you will learn a ton of new techniques. Hope you have a great Friday and weekend...thanks for stopping by! My kids went back to school a few weeks ago and that inspired me to dig out some 1st day of school photos that I haven't scrapped yet. These are from 2 years ago and it's crazy to see how they have grown in just the last 2 years. I used tons of Momenta product for this layout. 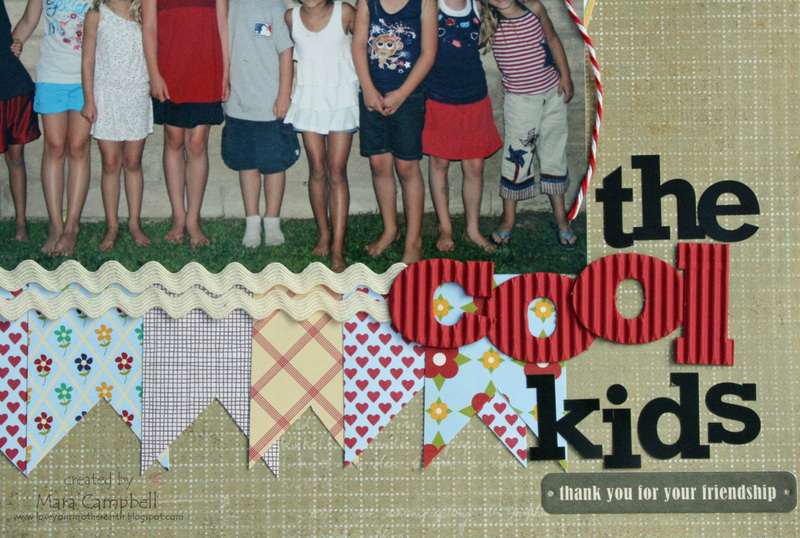 I used paper from the Family Outings paper pack, clear layered stickers, and 2 kinds of alphas. I think those polka dotted alphas are my favorite. Polka dots make me happy. 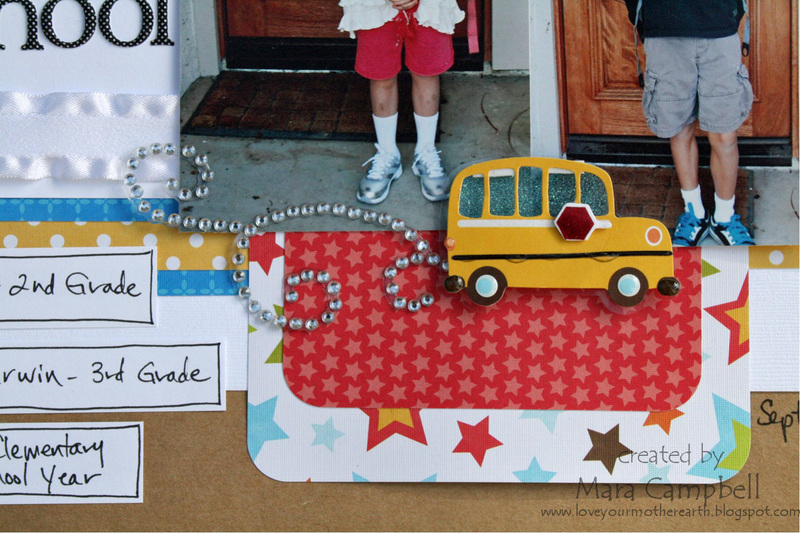 And love this cute bus!! I'm not usually into cutesy embellishments, but I couldn't pass up these fun school icon stickers. Gee, maybe in a few years I will scrap my first day of school photos from this year! By then my kids will be in middle school and i'm sure they just love standing in front of the front door getting their photos taken. Those photos will make good layouts. Ha ha! Hope you're having a good week and thanks for stopping by! I believe that everybody should have a good Monster Cookie recipe. Monster cookies are a great way to use up those half empty bags of white chocolate chips or those M&M's you forgot about in the pantry. Okay...who am I kidding. Does anybody really forget about M&M's in the pantry? Not in my house! These are peanut butter oatmeal chocolate chip M&M's Monster cookies. But you can add any kind of chips, any kind of M&M's, toffee chips, peanut butter cups...anything you can think of. It's a very versatile recipe! I picked up some fall M&M's the last time I was at Target and was excited to see all the fall candies out. At least I can pretend it's fall and pretend it's not 100 degrees outside when I'm shopping in Target. The air conditioning helps with that. Here is the recipe I followed: Monster Cookies by The Recipe Girl. Thanks for stopping by today!! Happy Hot Monday!! The weather this weekend was absurdly hot. It was in double digits at 10am when my kids were playing soccer. It was really insane and was proud of my kids for gutting it out. It was not easy to be out on that field this weekend. Today i'm sharing some cards I created using Momenta and Xyron products. 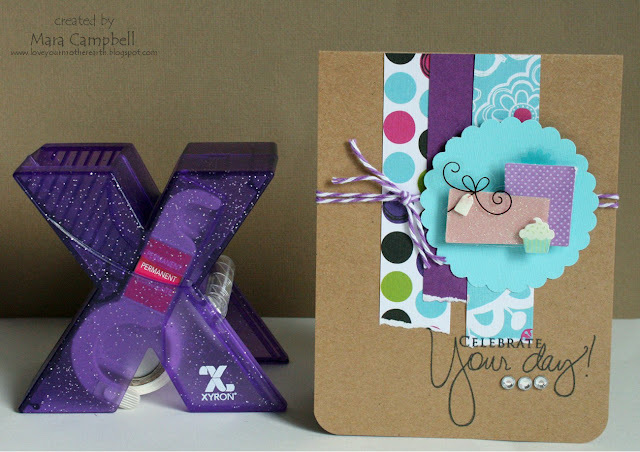 I used the small Xyron sticker maker to create some faux washi 'tape'. I cut strips of patterned paper and tore it on one end. I pushed the strips through the Xyron sticker maker to create the 'tape'. 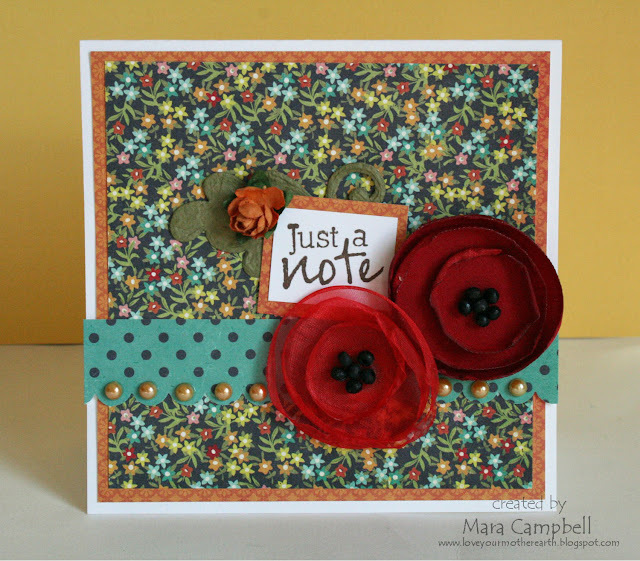 I used the new Doodle Floral paper from Momenta for the paper strips. I paired it with Momenta birthday clear layered stickers, twine, and a great Papertrey Ink sentiment stamp. 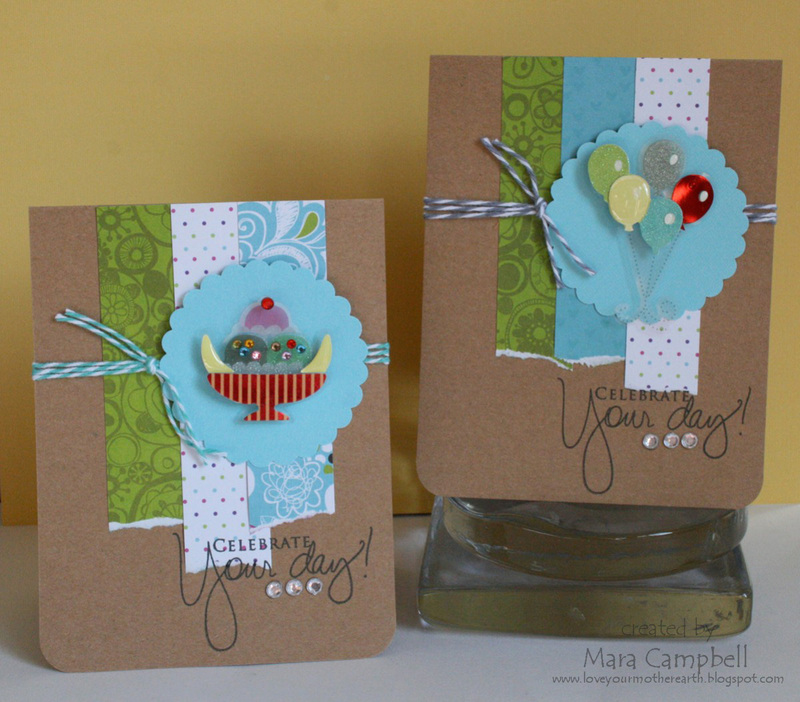 I made a trio of cards using a trio of clear layered stickers! 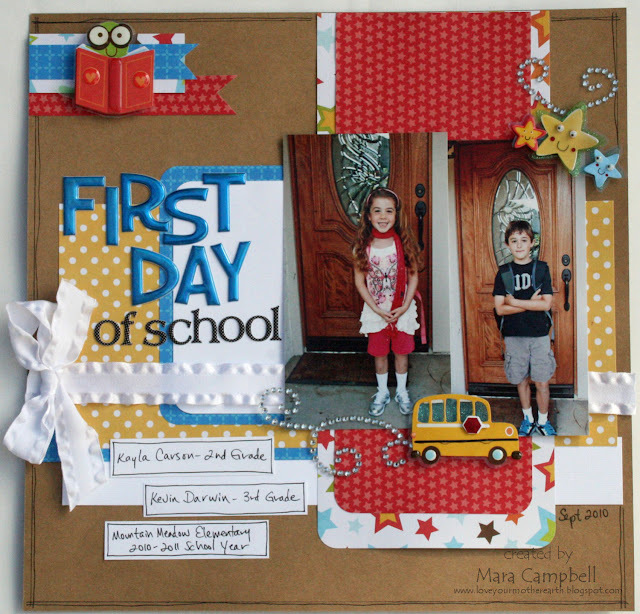 These were quick and easy to put together, thanks to Xyron and Momenta. Now I have a pretty nice stash of birthday cards which will come in handy in the next couple of months. I hope you stayed COOL this weekend. It's supposed to cool down this week and I'm looking forward to some fall weather. Have a great Monday everyone! Aren't those flowers so fun? 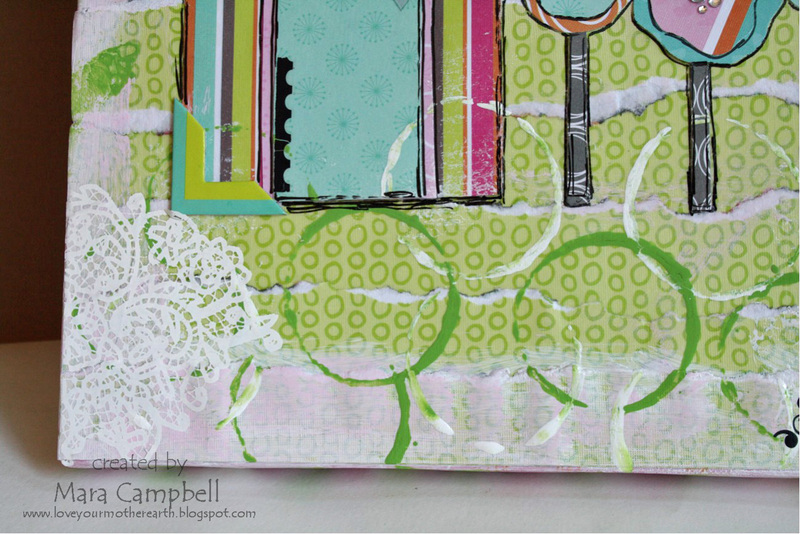 I love all the layers and the circles...so pretty. For my second card, I did something a little different for me. I created a scene on my card. 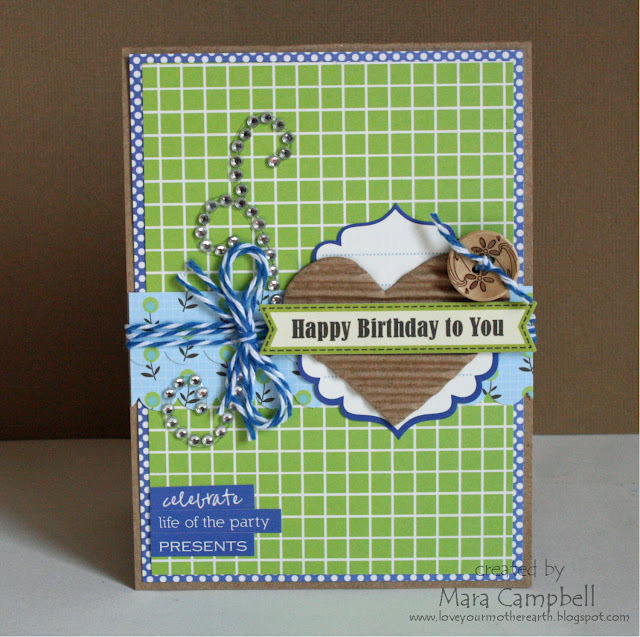 I'm not very good with the whimsical look but I tried on this card. I tore paper to create the rolling hills and handcut the pieces of the house. I had to trim the frilly trim a bit to make it work for the house. But I love the texture!! 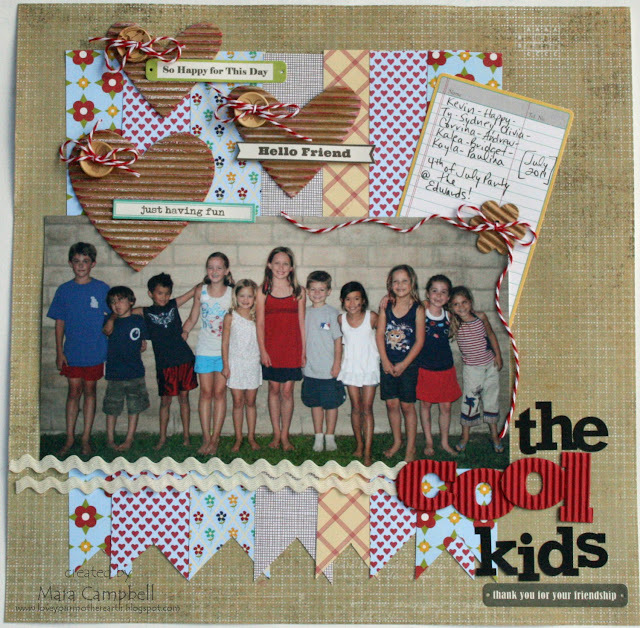 I tried to make the sentiment look funky with uneven cut lines...or maybe I had too many mojitos on my scrapbook retreat and couldn't cut in a straight line. I'll never tell. 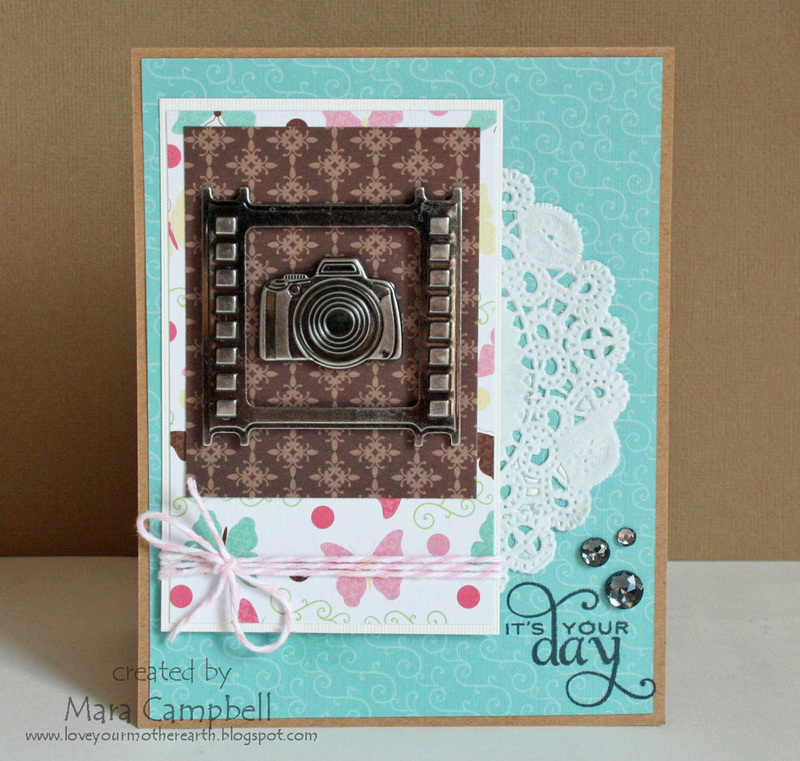 Please check out the other girls and what they created with the kit this month. Thanks Mary for the great supplies!! to Jillibean Soup!! They are celebrating their 4th birthday this month and have been encouraging fans to post birthday cards on their facebook page. 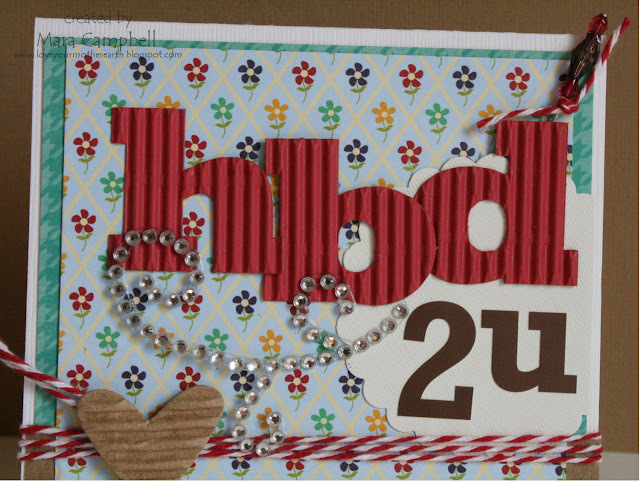 Since I had my Neopolitan Bean Soup papers out, I decided to make a Soup birthday card. 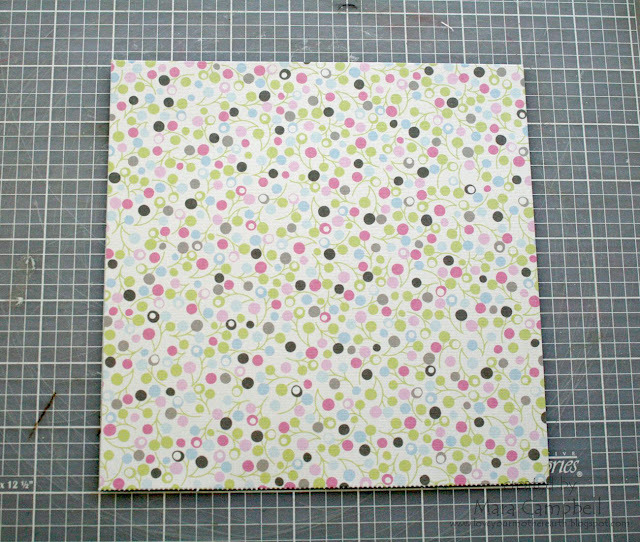 This is a 5x5 card, one of my favorite sizes to make. 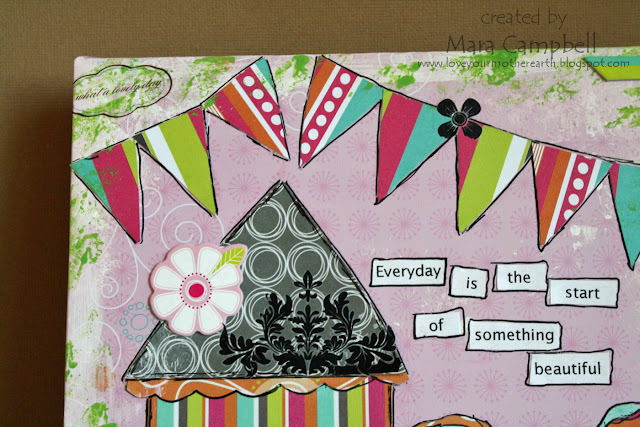 And it includes many of my favorite Jillibean goodies...corrugated letters, stick pins and of course paper! And a little bit of bling. This has been a busy week but I finally feel like I might have a handle on our crazy schedule. We are gearing up for hot weather and soccer games this weekend. Hope you're having a great week so far! Hi Everyone! 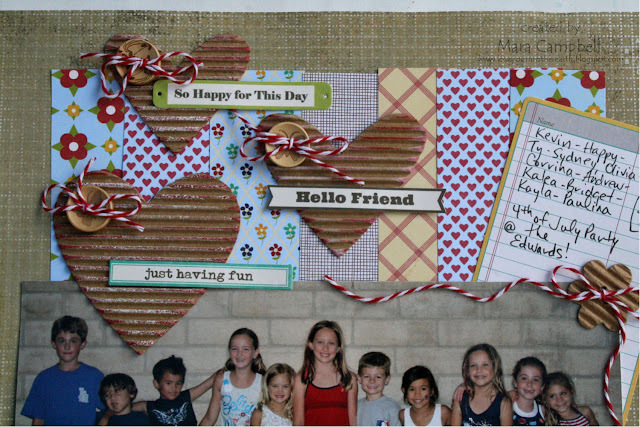 I'm here to share another layout I managed to finish on my scrapbook retreat. It's based off a Jillibean Soup sketch from their Bean Talk blog. 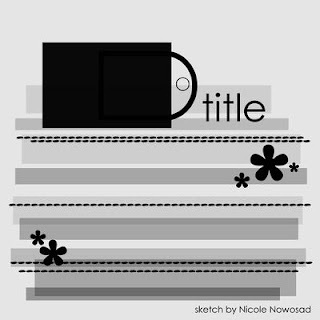 I loved all the horizontal lines on this sketch. I loved them so much...I flipped them and made them vertical lines on my layout. I used the Neopolitan Bean Soup papers, corrugated hearts, and lots of other Jillibean goodies. Our wonderful neighbor has a 4th of July party every year and these are all the kids from their party 2 years ago. Yes, I'm 2 years behind with my scrapping. I inked up these corrugated hearts with both red and white ink. I love the Jillibean buttons, too! I cut the end of the paper strips into flags and used 2 different alphabet fonts. I also love how these papers compliment all the 4th of July colors the kids are wearing. Thanks for the great sketch Jillibean Soup!! Happy Wednesday, everybody! Happy Monday!! I didn't mean to fall off the face of the earth last week. We have been running like crazy since the beginning of school. 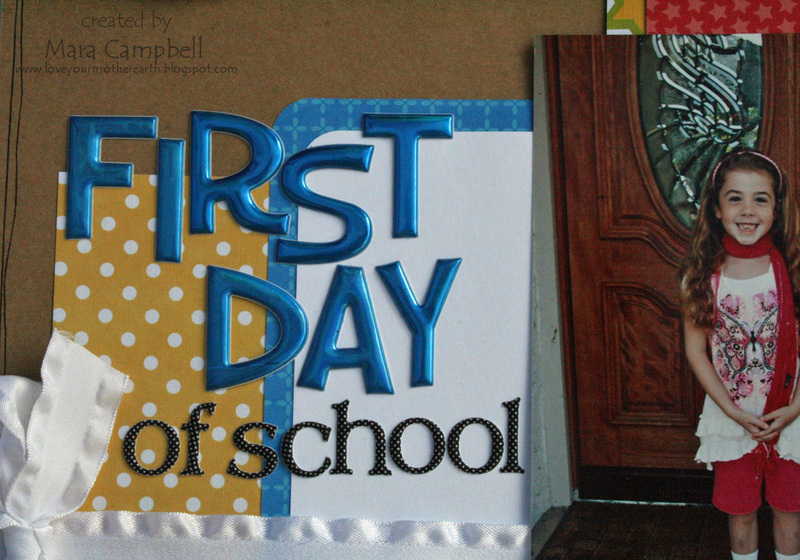 I think I have a handle on our crazy schedule and I hope to start posting more here on my blog. For starters...I gave Retro Sketch #28 a whirl. 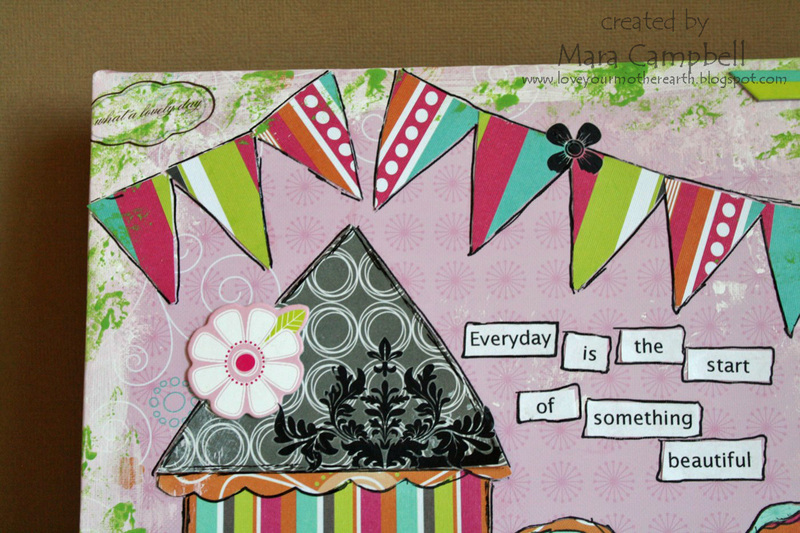 This past weekend I was on a scrapbooking weekend with my girlfriends and loved having this sketch to work off of. Sometimes I need the creative boost of a sketch when scrapping at 2am. 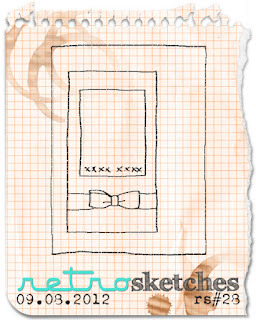 I pretty much followed the sketch exactly except for the addition of the doily. This is new paper from Momenta...it's called Brea's Room and I love it! Momenta also came out with all sorts of great metal embellishments. This frame and camera combo is one of my favorites. 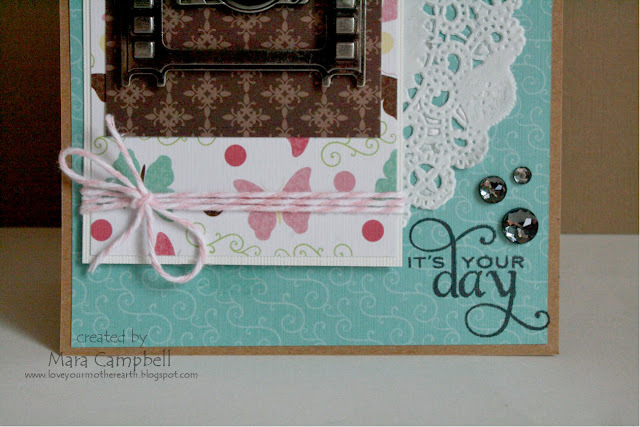 I added some pink twine, a few gems, and a Papertrey Ink sentiment. My creative time has been so limited lately. It was awesome to get away for the weekend and rekindle my love of pretty paper, baker's twine, doilies, and crafting. I hope you all have a great Monday! Thanks for stopping by! Hi Everyone! How was your labor day weekend? We had a nice weekend. Lots of swimming and snacking and cocktails and shopping and just hanging out. I can't believe that summer is over. Although it will stay hot around here for a while. My kids soccer season has started and some of their games can be brutally hot! 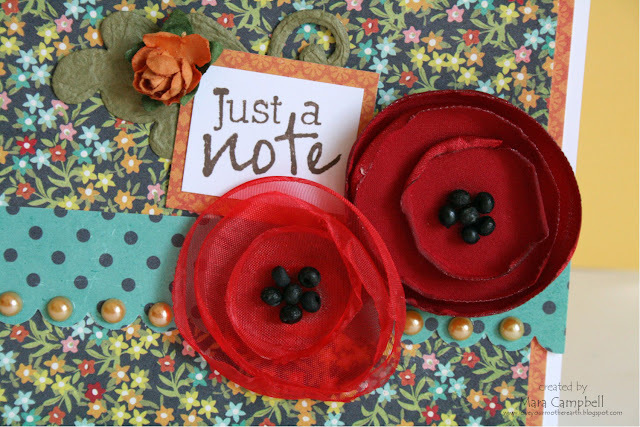 I am sharing a tutorial today that I did for the Momenta/Helmar blog event. 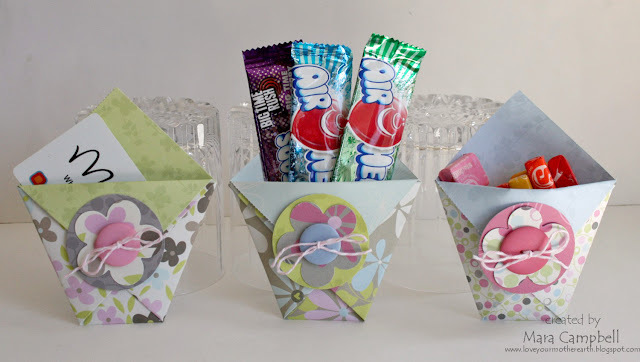 I made pouch treats bags using Momenta product and Helmar adhesive. Want to see how I did it? Fold the square of paper in half on the diagonal. 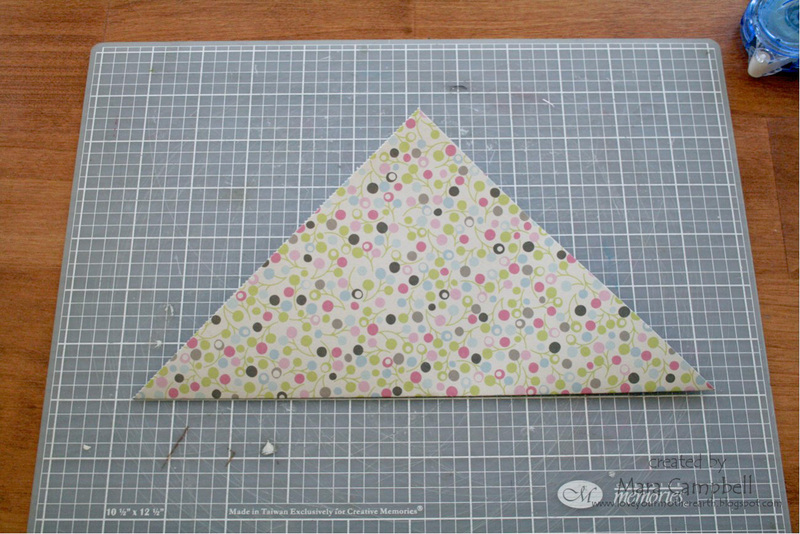 Fold one corner up and in, having it meet on the opposite edge. 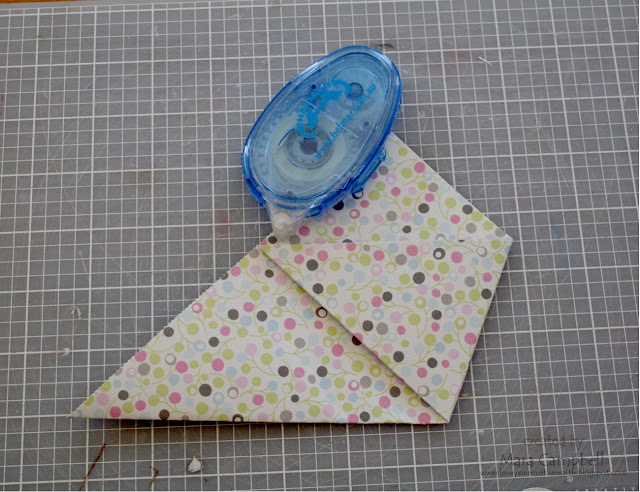 Add a little dot of Helmar Permanent Adhesive Runner to hold the corner down. Using the other corner, make a similar fold. 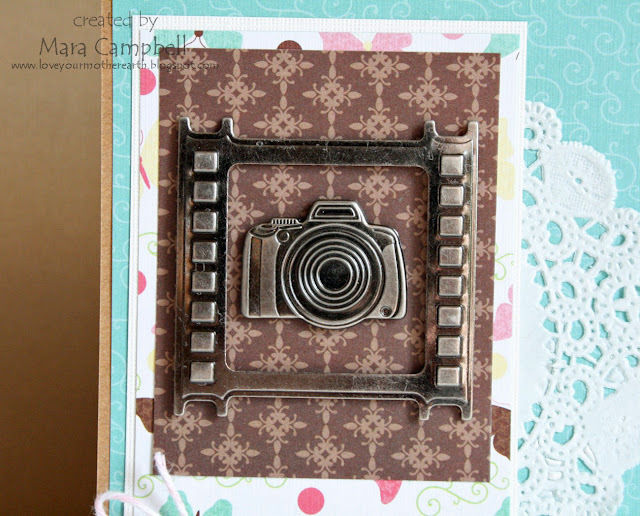 Again use the Helmar adhesive runner to hold the corner down. Fold one layer of the top corner down to create the pouch. 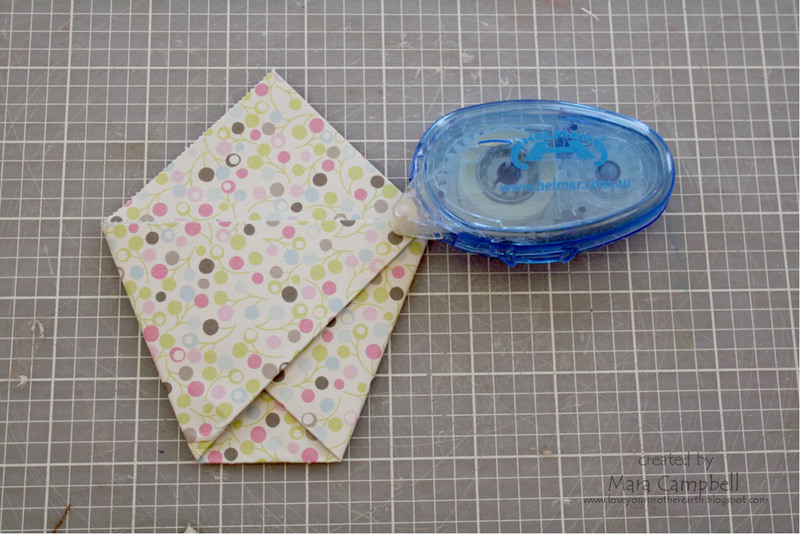 I then used my trusty punches to create a fun embellishment for the front of the pouch. I used the Helmar 450 Quick Dry Adhesive for my button. This adhesive is strong!! The great thing is how versatile these pouches are. They can hold just about anything! The 6x6 pouch is the perfect size for a gift card or some Airhead candies. 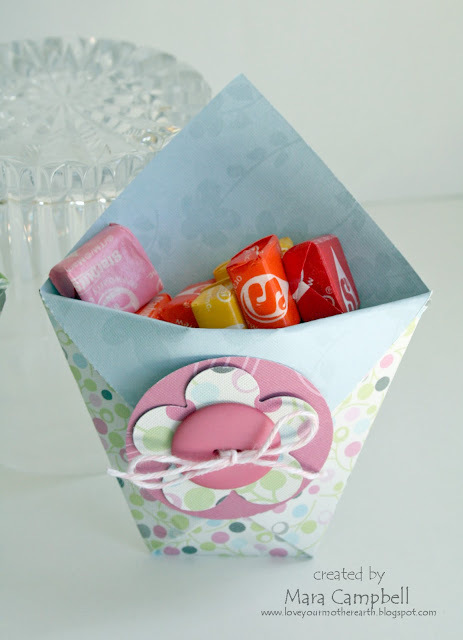 You can squeeze open the pouch a bit and then a handful of Starburst candies is perfect inside. Aren't these fun? 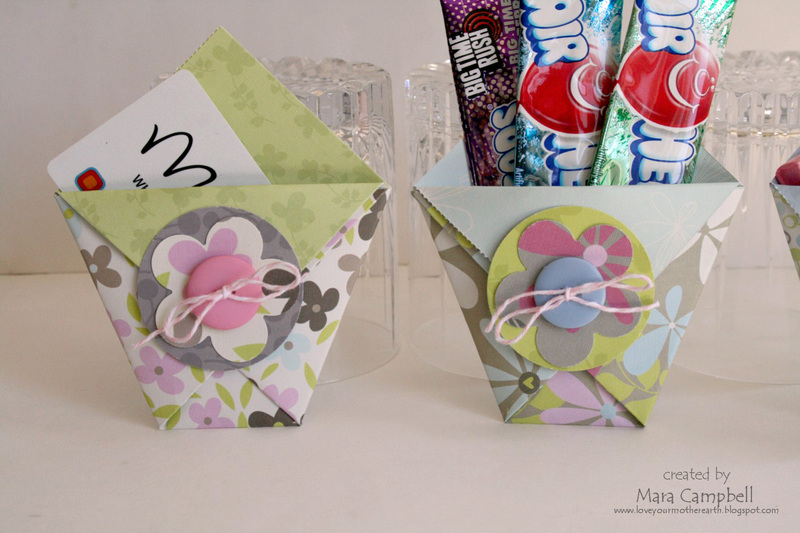 They are super easy and you can make them in any size you want. 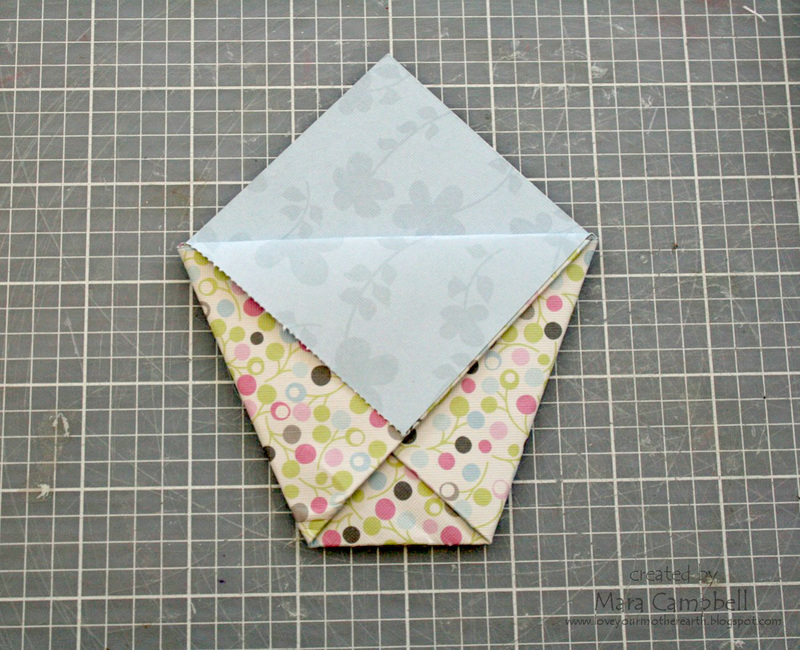 Just make sure you start with a square piece of paper and then you use the same folding technique. Happy beginning of the week!! Thanks for stopping by today!